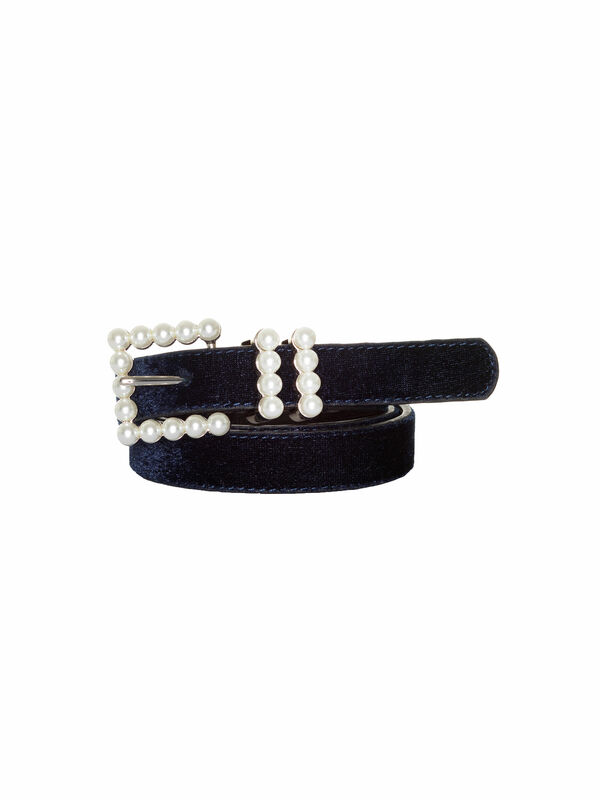 Pilly Pearl Belt https://www.review-australia.com/au/pilly-pearl-belt-navy/RE18ACC248.RENVY005.html Pearl detailing adds undeniable pretty charm to this must-have belt. A beautiful wine toned velvet is offset with metallic hardware and pearl studs, making this belt the ultimate accessory to dress up a basic dress or skirt and top combo for day or evening. Pearl detailing adds undeniable pretty charm to this must-have belt. A beautiful wine toned velvet is offset with metallic hardware and pearl studs, making this belt the ultimate accessory to dress up a basic dress or skirt and top combo for day or evening. Pilly Pearl Belt is rated 4.9 out of 5 by 11. Rated 5 out of 5 by Loren from A gorgeous touch I am utterly obsessed with this belt. It is so gorgeous and unique. If I ever want to add a special flair to an outfit, the Pilly Pearl Belt is just the thing. I love it so much. Rated 5 out of 5 by Hayley from It’s the little things! Absolutely love this belt so much also purchased it in the wine colour - adds such a lovely detail to a Review outfit - the combination of pearls and velvet is luxurious! Rated 5 out of 5 by wicky13 from Great Style The Pilly Pearl Belt is gorgeous and adds a bit of luxury to your dresses and skirts. I also have the black and navy in this belt and always feel good wearing it. Rated 5 out of 5 by Bexstar from So elegant I’ve tried this on in store absolutely love it and I’m buying it next month with my loyalty rewards! The maroon one is perfect with that little black dress look! Rated 5 out of 5 by Jo48 from Gorgeous belt I bought this to wear with a dress for a wedding. Made the dress look elegant and the belt looked stunning. Rated 5 out of 5 by Bexstar from Such beautiful texture! Bought this to go with a matching cardi and live live it! I’ll be wearing it for my sisters wedding!